Can Liverpool maintain their perfect record against Swansea? Hooray! I hear you all cry, the international break has finally ended. I don’t know about you but I bloody hate international breaks! Anyway, we’re here and we’re back, ready to face Swansea with the incentive of putting ourselves back at the top of the table. If the Reds win they will be 3 points clear of the chasing pack. Injuries for Liverpool mean that there are a few doubts hanging over key players. Daniel Sturridge, for example, is presumed to be fit for tomorrow night’s game but it would still be a quick return for the in-form forward. Kolo Toure is also apparently available to start. Joe Allen is also a doubt whilst Glen Johnson, Aly Cissokho and Sebastian Coates are all out long term. Luis Suarez is also still serving his ban. For Swansea they are without Taylor, who isn’t expected back until early October, and they also have doubts hanging over Dyer and Tate. Jonjo Shelvey, who of course is an ex Liverpool man, also had to quickly regain fitness but it is widely agreed that he will start tomorrow to line-up against his old mentor Steven Gerrard. The last time the two sides met was in February, this year. Brendan Rodgers led Liverpool to an emphatic win over his old team with the Reds finding the back of the net on 5 occasions, twice from the penalty spot. The last time Liverpool were at the Liberty the game ended in a 0-0 draw. 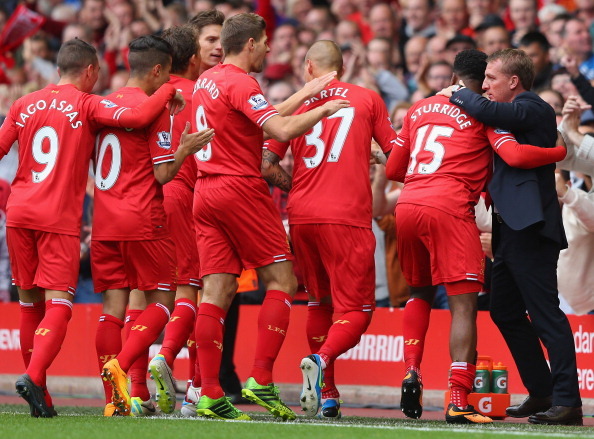 Liverpool are boasting a perfect record in the Premier League so far and they also haven’t conceded yet. Swansea, on the other hand, have lost 2 of their 3 opening matches but the games they lost were against Manchester United and Tottenham Hotspur. Swansea are currently placed 18th in the league but could drastically move up the table if they manage to pull off a win on Monday night. In this section of the post, I would usually supply you with a tasty stat sandwich but unfortunately I appear to have beaten the stats folk today and so I don’t have a sandwich for you! Those bloody stats folk need to get a jog on next time! Looking at Liverpool’s start to the season it is very easy to assume that the Reds should pick up three points here but I don’t think that’s the case. Swansea are a very good side and even more so at home. I think tomorrow is the sort of game that could grind Liverpool to a very annoying halt. However, if Daniel Sturridge starts, as it appears he will do, you would hope that he will be able to put Liverpool into the lead and from a leading position I think Liverpool can have this game in the bag but if Swansea finds the net first, I think Liverpool may struggle to break Swansea down. Enjoy the match folks! And don’t forget to follow @_TheLiverBird on Twitter!